these boots were made for working . . . .
Dad has been gone since 2005, and I cannot part with the last of his old boots (or his old Stetson hats, for that matter, but that’s another story). 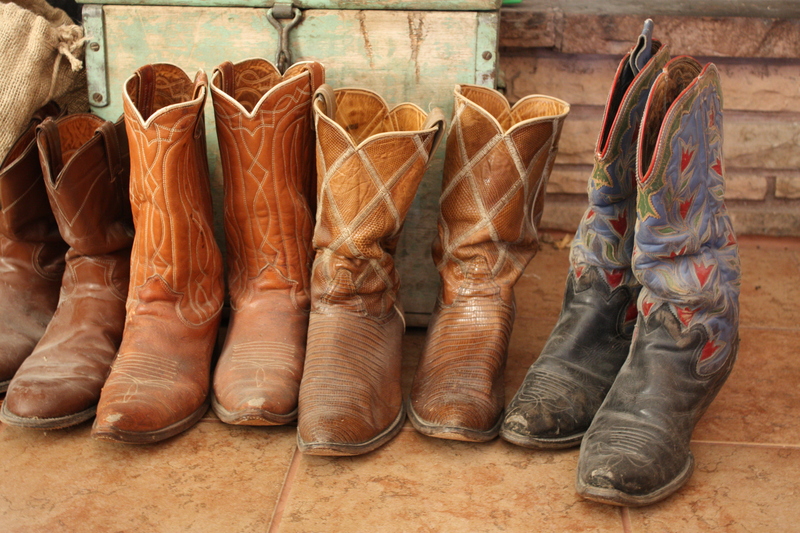 The black ones with the fancy tops were custom made from the Western Boot Company, Tucson, Arizona. He bought those for about $34.50 and it was a princely sum in the 1930’s when he ordered them. I still have a little catalog published by the boot maker that describes these boots as “classy and stylish tulip and leaf inlaid design with three or more rows stitching. . . fancy wing tip toe and heel as shown, $3.25 extra.” He obviously decided he couldn’t afford the wing tip toe. The steel caps on the heels of this particular boot got him into a little trouble that brings a smile when we remember the uproar. When I was about 10 Dad left me at home with my older brother while he and Mom made a trip to town. Naturally, a fracas ensued when someone got the bright idea to turn the garden hose on inside the hallway leading into the house. It was a blistering hot day and we chose the obvious way to cool off–a water fight. Unfortunately (or perhaps fortunately) they arrived home in the “heat” of the battle and there was no time to clean up the mess. Dad came thundering through the screen door and up the hallway in those steel capped boots. When his heels hit the water on the linoleum floor, up flew his feet and down went everything else. Needless to say, two kids who, at that point could not resist screeching with laughter at the sight of Dad on the floor, suddenly realized we were in harms way and took off like two scalded jack rabbits. As I remember, Dad was so furious with us that he grabbed an old platform rocker that sat in the corner of the living room and pitched it down the hallway. By that time we had not let the screen door hit our behinds as we went through it. Dad had a ferocious temper and he had obviously had a hot time in the old town. We didn’t come home until he had a chance to cool off. By that time Mom had cleaned up our mess and though we got a chilly reception from Dad, he didn’t offer up any additional punishment. I guess that’s one of the many reasons why I cannot part with Dad’s old boots. This entry was posted in Working and tagged old cowboy boots by bygeorge. Bookmark the permalink. That’s a fracas I remember also. And what a fracas it was! “Jim” raised a house full of brats. I think the boots should definitely be saved.